Florence Nightingale: The Lady with the Lamp--Who's "Shrieking Aloud in Her Agony"
There is perhaps no more unlikely spokeswoman for the horrors of nineteenth-century views of “true” womanhood than Florence Nightingale. * I say “unlikely” because I am assuming that many, if not most, readers are like me and still associate Nightingale with the carefully sanitized biographies they read when they were children. Although I’ve been madly consuming newly published women’s biographies and histories during the last twenty years or so, Florence Nightingale remained “the lady with the lamp,” a saintly figure, the sheltered and pampered daughter of a wealthy English family who sacrificed marriage and motherhood in order to devote herself to ameliorating the sufferings of others. I should have known better, of course—the hint that there was something more to be known about Nightingale’s life was right there, all along, in Virginia Woolf’s A Room of One’s Own. “Among your grandmothers and great-grandmothers,” Woolf writes, “there were many that wept their eyes out. Florence Nightingale shrieked aloud in her agony.” Woolf adds a footnote here—“See Cassandra. . . .” But I had read past Wolf’s signpost, completely overlooking it. Nightingale’s angry “Cassandra” was written before she was able to realize her goal of dedicating her life to meaningful work—it was written, in fact, when she was in the midst of the blackest despair. Born in 1820, the young Nightingale seemed to conform to the expectations of her family and her class, but when she was not yet seventeen, she experienced a kind of religious vision. She later described this moment of awakening: “On February 7th, 1837, God spoke to me and called me to His service.” By the time she entered her twenties, still not sure what service God might have called her to, she rejected what she called the “useless trifles” of women’s lives. “What is my business in this world and what have I done this fortnight? I have read the ‘Daughter at Home’ to Father and two chapters of Mackintosh; a volume of Sybil to Mamma. Learnt seven tunes by heart. Written various letters. Ridden with papa. Paid eight visits. Done company. And that is all,” she wrote. She feared the emptiness of this kind of life—“I see . . . so many of my kind who have gone mad for want of something to do.” Expected to marry, Nightingale found no relief for her despair in the “conversation of all these good clever men” that should, she was told, “be enough” for her. “Why am I starving, desperate, diseased on it?” she wondered. “Cassandra” was written between 1850 and 1851, just before those years of opposition ended. Although the first-person narrator of “Cassandra” is never identified with Nightingale herself, it is hard not to read the essay as a reflection of Nightingale’s own life—that is exactly what Woolf does, for example. The title of the essay alludes to the Greek Cassandra, to whom the god Apollo gave the gift of prophecy—but with the curse that no one would believe her prophecies. Although there is no reference at all to Cassandra in the body of the essay, the impassioned writer still seems to see herself as a prophet who is ignored. Is she also, like her Greek namesake, cursed? Is she doomed know what should be done but forever unable to do it? Interestingly, middle-class women like Nightingale do have rooms of their own. In “Cassandra,” Nightingale focuses her attention on the “drawing rooms” of Victorian homes where women live out much of their daily lives. The drawing room is a feminized space, although men do join women there at times during the day, after dinner, for example. But men’s lives and work are carried on outside this domestic space, whereas women must spend their lives at home, confined to such rooms. The answer, Nightingale suggests, is that women are “never supposed to have any occupation of sufficient importance not to be interrupted.” It is their “duty,” in fact, to be always ready, prepared to give up anything, at any moment, for “every trifler” who is “more selfish than themselves.” Women may be wasting their time on nonsense and trivialities in the drawing room, but that is only because they are always at someone else’s disposal—apt at any moment to be called away from whatever they are doing. In rejecting marriage and traditional “family values,” Nightingale knows that she is challenging the fundamental institutions of her society. In the end, knowing that her analysis of these institutions might be rejected or attributed to a “womanish” tendency to “complain,” she takes a radical move, co-opting her critics by recalling the example of Jesus: “Was Christ called a complainer against the world?” she asks. In rejecting notions of “true womanhood” that limit women to their constricted lives inside the family and their subservience to family interests, Nightingale reminds her readers of Jesus’s own rejection of his birth family—his mother, his brothers—and his substitution of a “true” family: “Who is my mother? And who are my brethren? Whosoever shall do the will of my Father which is in heaven, the same is my brother and sister and mother” (Nightingale is paraphrasing Mark 3:33 and 3:35). But Nightingale knows how dangerous redefining “family” is for a woman: “But if we were to say that, we should be accused of ‘destroying the family tie,’ of diminishing the obligation of the home duties,” she observes. The picture Nightingale paints of this dying woman is bleak: “My people were like children playing on the shore of the eighteenth century. I was their hobby-horse, their plaything; and they drove me to and fro, dear souls! Never weary of the play themselves, till I, who had grown to woman’s estate and to the ideas of the nineteenth century, lay down exhausted, my mind closed to hope, my heart to strength.” The bitter truth is that the dying woman is freed only by her death; “Welcome, beautiful death!” she cries. Several years after her return from the Crimea, in 1860, Florence Nightingale suffered a physical collapse. Like so many women, she was prescribed complete bed rest. 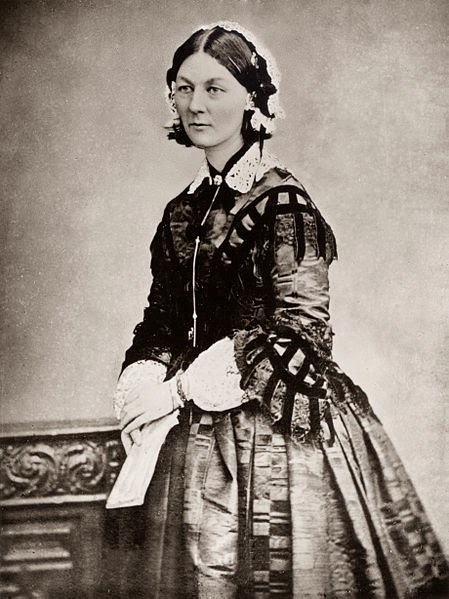 As Monica Baly and H. C. G. Matthew write in their Oxford Dictionary of National Biography essay on Nightingale, her collapse may have been the result of a recurrence of the debilitating Crimean fever she had suffered in 1856, although it may also have been a cardiac problem of some sort. Others have suggested a calculated psychosomatic component to Nightingale’s illness, that it was perhaps “psychoneurosis with a purpose,” a “protective” mechanism by means of which Nightingale could avoid her family and devote herself to her work. But, while she spent the next twenty years as an “invalid,” seeming to accept her role as patient, Nightingale didn’t entirely follow doctor’s orders. She refused to give up her work. She knew that, without work, a woman’s isolation and inactivity would destroy her. And so, for the twenty years she spent in her “sickroom,” Nightingale carried on with her work, reporting on sanitation in India, involving herself with the training of midwives, recommending improvements in hospital design, and supporting reform in English workhouses. After the death of her mother in 1880—in other words, after some twenty years—Florence Nightingale rose from her bed, left her sick room, and re-entered the world. She certainly wasn’t as vigorous as she had been, nor was she actively involved in government service. Although she may have been “increasingly out of touch” with developments in public health care, she lived another thirty years . . .
Conventionally dated to 1852, Florence Nightingale’s “Cassandra” was privately published in 1860, in the second volume of her Suggestions for Thought to Searchers after Religious Truth. It was not widely available until 1928, when it appeared as an appendix to Ray Strachey’s The Cause: The History of the British Women’s Movement. Nightingale’s essay is available in Myra Stark’s Cassandra, an Essay by Florence Nightingale. The text is also available in Mary Poovey's Cassandra and Suggestions for Thought by Florence Nightingale. The 1936 film starring Kay Francis as Florence Nightingale, The White Angel, is not currently available on video or DVD, but you can occasionally catch it on Turner Classic Movies. I still enjoy it whenever it's broadcast. There are many excellent biographies of Nightingale, but you might start with the materials available online at the website of the Florence Nightingale Museum. Most of all, though, follow Woolf's command: "See Cassandra!" *This post has been adapted from Reading Women's Worlds from Christine de Pizan to Doris Lessing: A Guide to Six Centuries of Women Writers Imagining Rooms of Their Own.